I’ve been dying to try one of those over-the-top milkshakes that have been catching my eye on social media for some time now. Also known as freakshakes, some magnificently indulgent ones can be found in Australia, the UK and New York City. It’s certainly on my bucket list to go meet up with one of those glorious creations in person and dig in! In the meantime, I decided to concoct my humble version here at home, in honor of National Unicorn Day. Yup, unicorns have their own day! Whoever invented celebrating national days, I thank you. 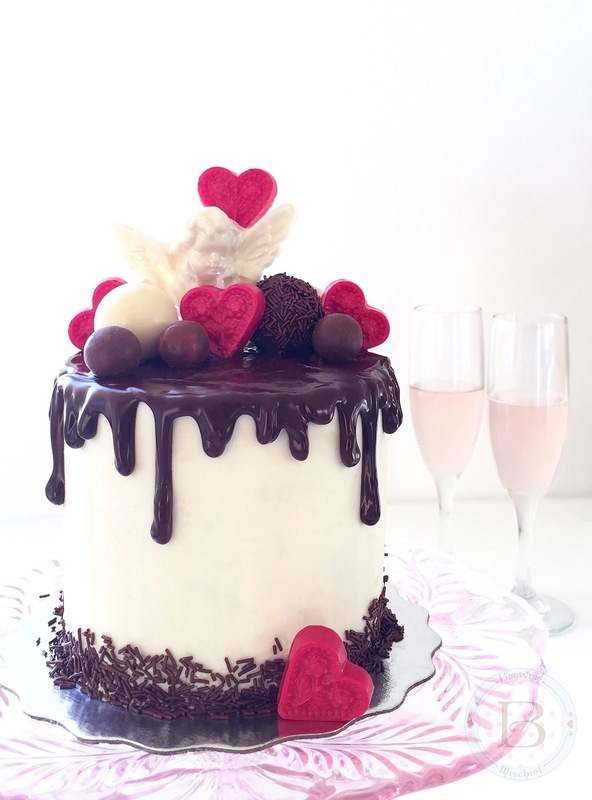 It gives me a great excuse to indulge in a delicious treat…not that I need an excuse. 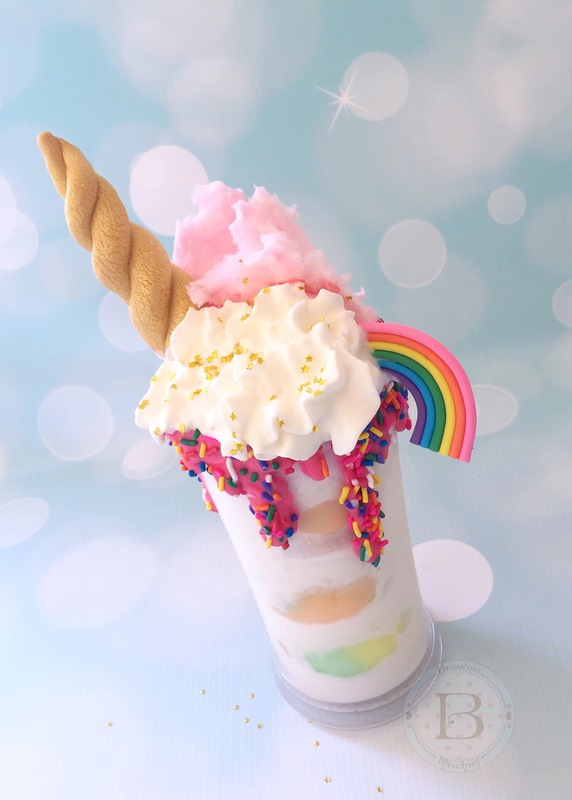 There are so many versions of unicorn milkshakes out there and I love every one of them! In fact, anything that’s unicorn related sets my heart aflutter. The current unicorn craze won’t seem to go away and, as you can imagine, that is just fine by me! One of the cutest unicorn things I’ve seen is my adorable cousin Nicole, scooting around in her fluffy unicorn slippers. Unicorn slippers are a must while drinking a Unicorn Rainbow Milkshake! Place candy melts in a microwave safe container. Heat in the microwave for 1 minute at 50% power. Stir. Heat in the microwave for 10 second intervals until melted and smooth. If your melted candy melts are too thick, stir in melted shortening a teaspoon at a time until desired consistency is reached. Transfer the melted candy melts to a disposable piping bag or a squeeze bottle. (Alternately, you can use a plastic zip bag.) Place your glass on a rimmed plate or baking sheet. Snip off the tip of the piping bag and drizzle the melted candy along the rim of the glass. Immediately sprinkle on the rainbow sprinkles, before the melted candy sets. Combine vanilla ice cream and milk in a blender and blend until smooth. Place 3 scoops of rainbow sherbet into your glass. Pour vanilla milkshake over the sherbet scoops in your glass. 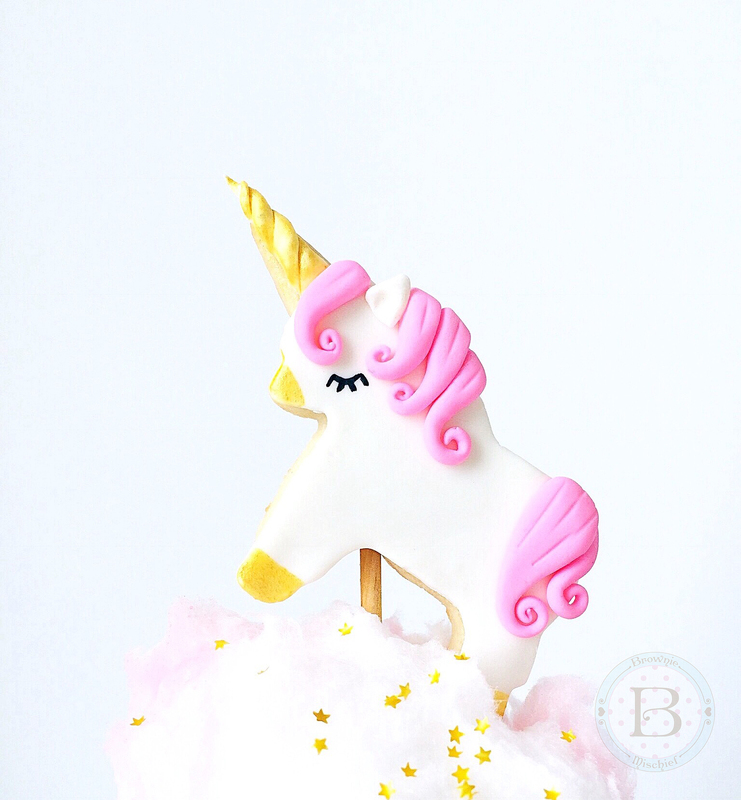 Top with cotton candy, whipped cream, a Unicorn Horn Cookie, a Fondant Rainbow Topper and a sprinkle of edible gold star glitter. Put on your unicorn slippers and enjoy your unicorn milkshake! 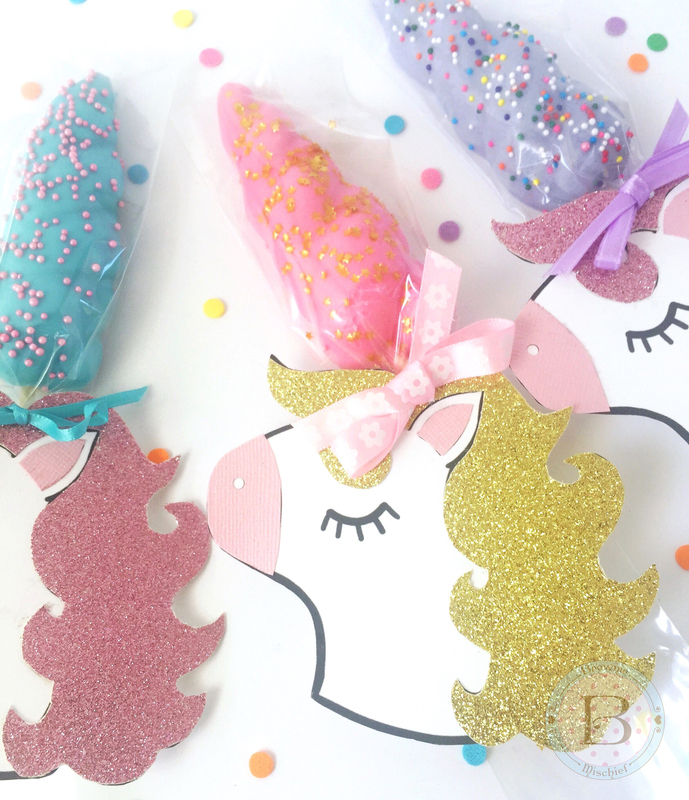 Sugar cookies shaped like unicorn horns. In a large bowl, cream butter and sugar with an electric mixer at medium speed until light and fluffy, about 2-3 minutes. Add the egg yolk and extracts. Beat at medium speed until combined. Gradually add the flour mixture, beating at low speed just until combined. Do not over mix. Cover dough with plastic wrap and chill in the refrigerator for 30 minutes. 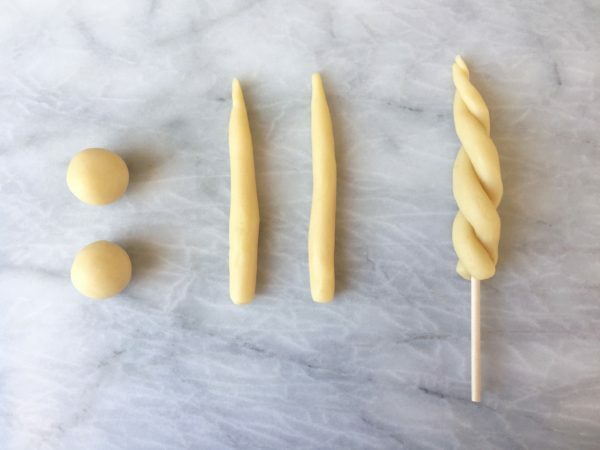 Form dough into tablespoon size balls. (I used a tablespoon cookie scoop to make them uniform in size.) 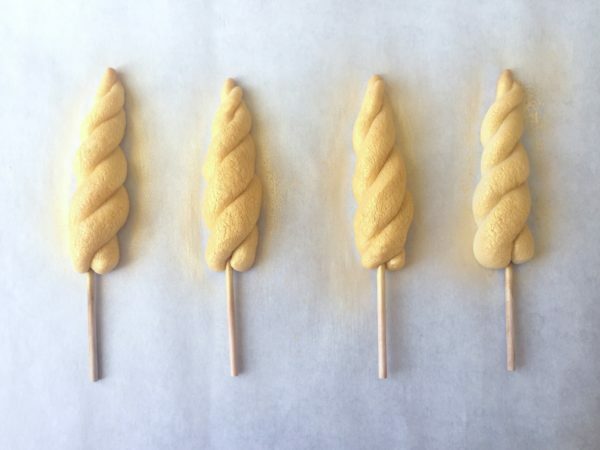 Form each ball of dough into a log, tapering at one end. Twist two logs together to form a horn shape. Repeat with remaining logs. Insert skewers or lollipop sticks, if using. Place about 2 inches apart on prepared cookie sheets. Cover with plastic wrap and chill in the refrigerator for 30 minutes. Preheat oven to 350ºF. Bake until golden brown, about 13-15 minutes. Transfer cookies to wire rack to cool. When cookies have cooled completely, place them on a parchment paper lined work surface. 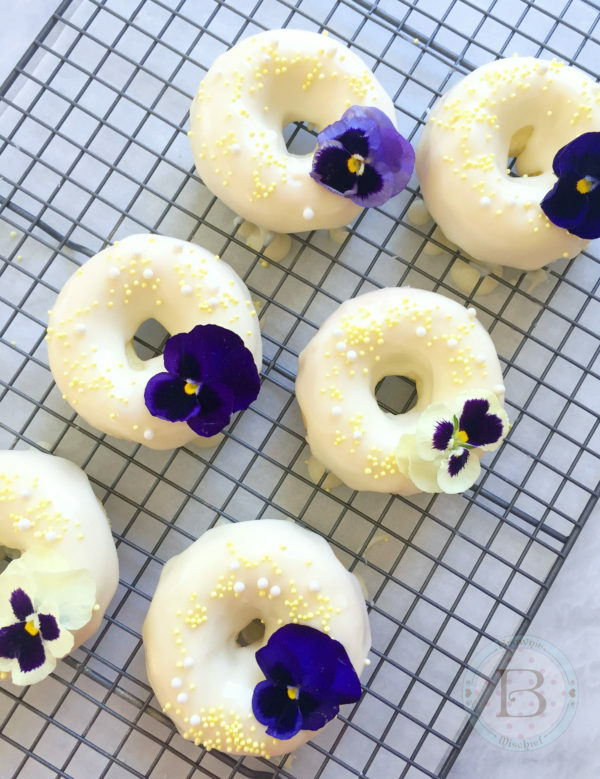 (You can use the same pieces of parchment paper that you baked them on.) If you are using lollipop sticks, you may want to cover the sticks with plastic wrap to keep them clean. Spray with edible gold spray. Let dry. Apply an additional coat of edible gold spray, if desired. 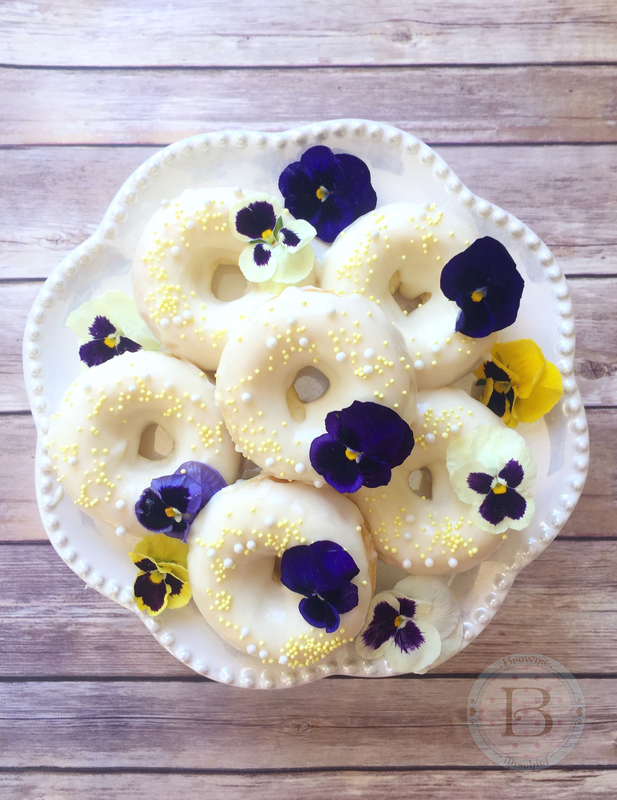 *This recipe makes about 14 unicorn horn cookies, but if you only need a few, you can roll out the remaining dough and use your favorite cookie cutter to make cookies. The baking time will be a bit less. 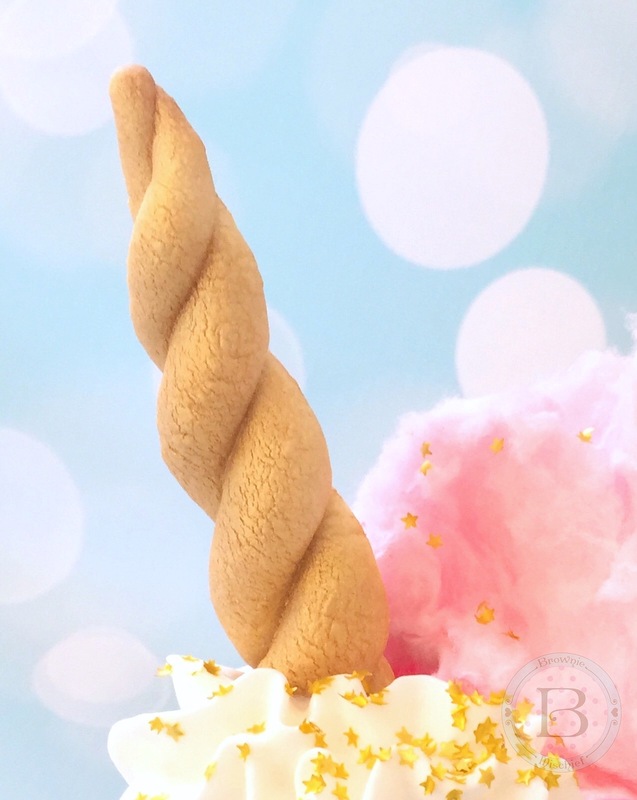 You can also make as many unicorn horns as you need and freeze the remaining dough for later use. **To make toppers as shown, use wooden skewers. To make cookie pops, use lollipop sticks. Dear marshmallows, why are you so sweet and fluffy? I shall call you squishy and you shall be mine! Yes, it’s true, I’m a bit crazy about marshmallows. 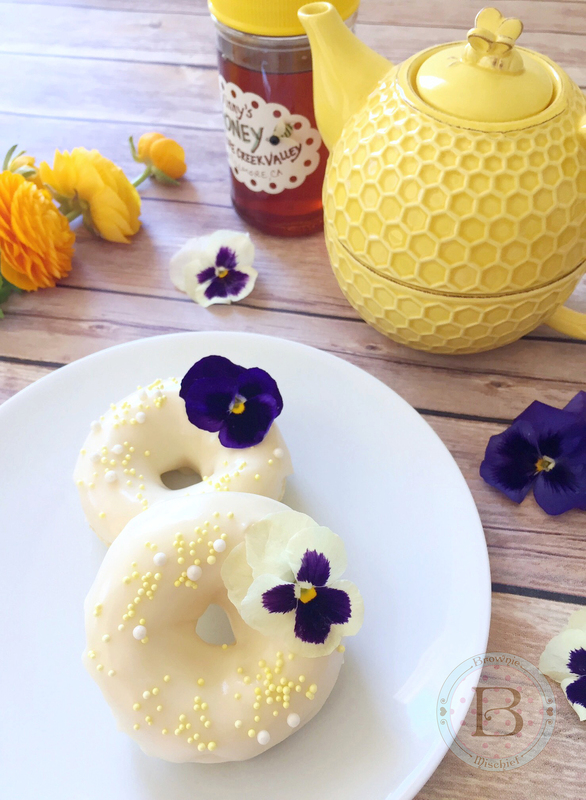 This post is nothing short of a marshmallow fest! First, my daughter and I made some Sparkly Marshmallow Hearts that are super fun and easy to make. I literally want to put them on everything! 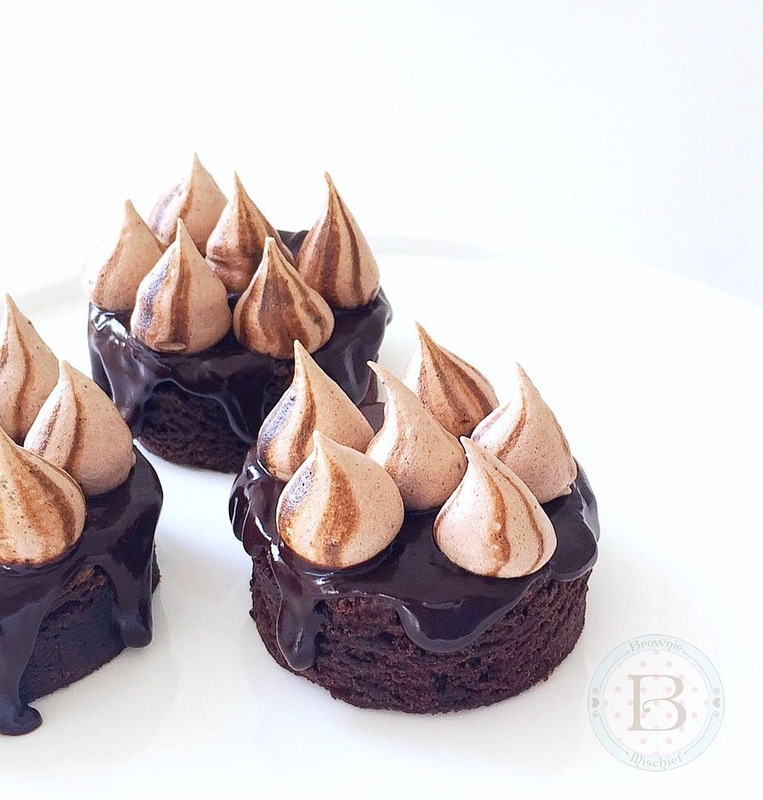 How cute do they look on this mini cake? They also make adorable cupcake toppers! To view the Sparkly Marshmallow Hearts tutorial click here. We also had some fun with Puffy Poles. In case you’re not marshmallow savvy, Puffy Poles are marshmallows that look like chubby barber poles. They’re very popular on dessert tables and candy buffets. We used pink ones, which have a subtle strawberry flavor. We applied them to the pictured 4-inch diameter by 2 1/4 inch tall strawberry cake, which was crumb coated with a thin layer of vanilla buttercream. We used buttercream to adhere them to the sides of the cake. To find Puffy Poles click here. 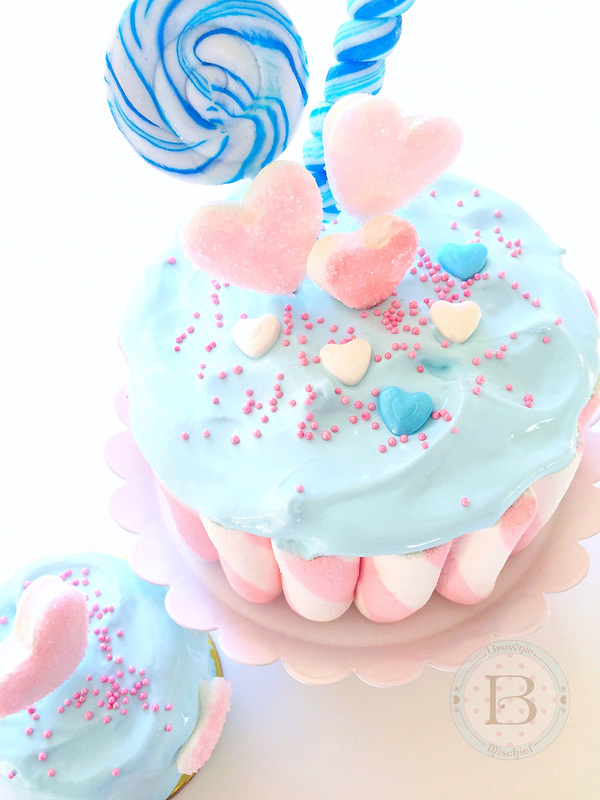 Next, I made some Billowy Sky Blue Marshmallow Frosting to share with you. One of the things you’re going to love about this frosting, besides being yummy, is it’s natural beauty. You can simply spoon it on, no piping or fancy tricks necessary. 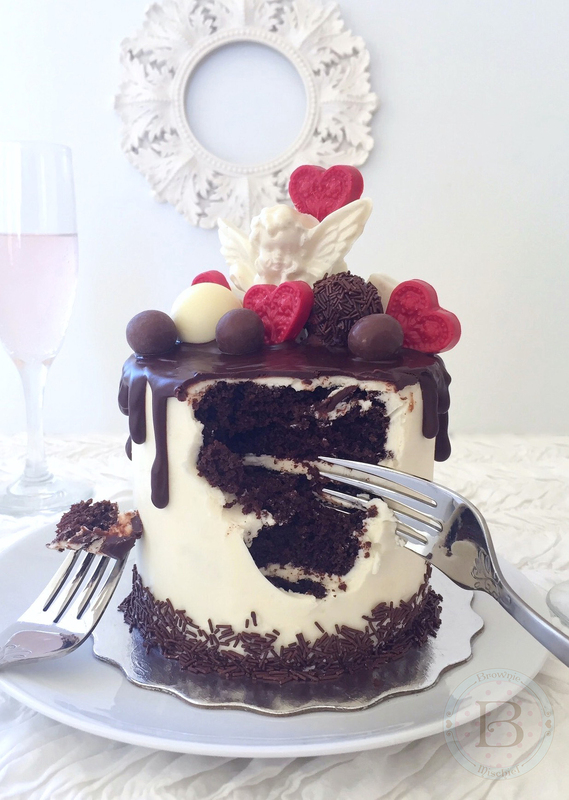 Everything it touches becomes an ethereal cloud of deliciousness! The recipe is below. 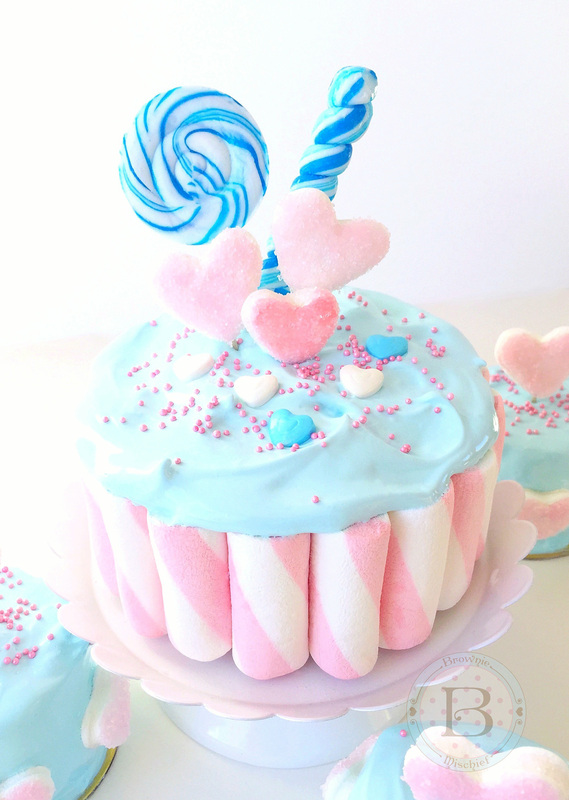 Fluffy, glossy, sweet marshmallow frosting. In a large heatproof bowl, whisk together sugar, egg whites, water and cream of tartar until frothy. Place bowl over a pan of gently simmering water, making sure the water isn't touching the bottom of the bowl. Whisk mixture until temperature reaches 160° and sugar is completely dissolved. Remove bowl from heat. Add extracts. Beat mixture with the whisk attachment of an electric mixer on high speed until stiff and glossy. Add a small amount of food color with a toothpick and mix on low speed. Continue adding food color, a little at a time, until desired shade is reached. Use a clean toothpick for each addition. 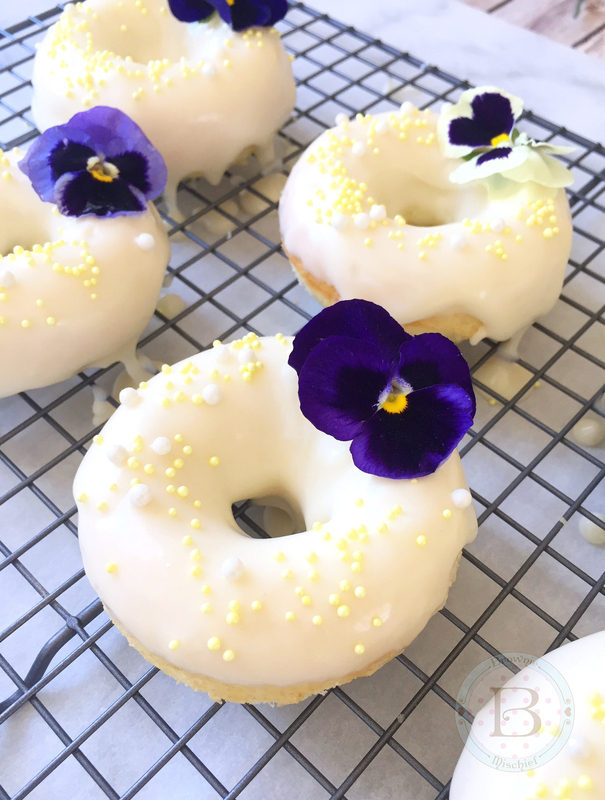 *It's important to dissolve all of the sugar when making this frosting. Ultra fine sugar dissolves easier, but if you are unable to find it, you can use regular granulated sugar.